During 2012-2016, Marianopolis students had the highest average R-Score in pre-university programs in the province (29.5). They also made up the highest proportion of students graduating from a pre-university program with an R-Score above 34 (9%) *. The following chart shows the R-Score distribution of students accepted at Quebec universities during 2012-2016. Attending Marianopolis is likely to help your R-Score. That’s because Marianopolis students benefit from a higher group strength due to the stronger academic strength of the students admitted to the College. As with any group, your R-Score also reflects your relative standing in that group (i.e., your grade relative to the grades of the other students in the course). Furthermore, Marianopolis students are consistently admitted in great numbers to some of the most competitive university programs. ▸ What is the R-Score? The R-Score is a calculation of grades that is used by Quebec universities to gauge academic performance in college relative to other Quebec students. For each of your courses, you receive a score that takes into account three components: your grade, the group average (and standard deviation), and group strength (which is determined by the high school grades of the students in the course group). Your overall R-Score is a weighted average of the R-Scores you obtain for each of your courses. BCI (bureau de cooperation interuniversitaire), a private, non-profit organization representing all Quebec universities, calculates the R-Score. ▸ How do Marianopolis students’ R-Scores compare to students in other colleges? 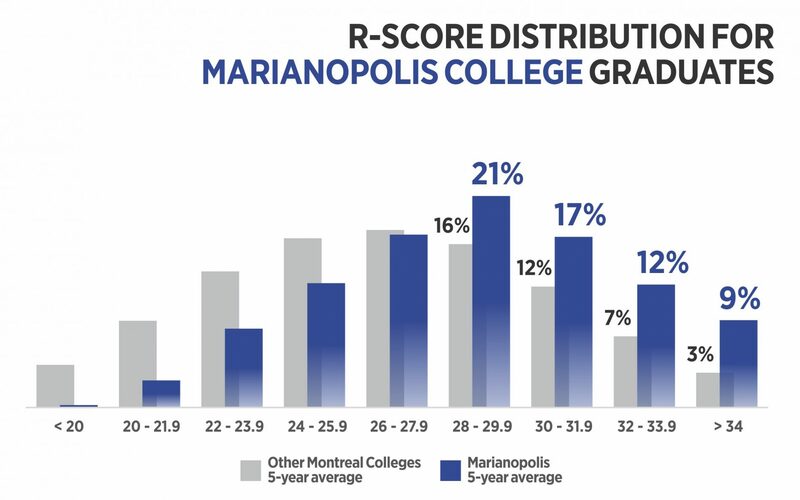 Marianopolis graduates achieved higher overall R-Scores on average relative to students from other Montreal colleges for each of the College’s academic programs over a five-year sample, 2012-16. CREPUQ/BCI data, accessed October 2017. ▸ Is the R-Score calculated for every course? Yes. Generally, an R-Score is calculated for every course you take as part of your program. When a course has many groups, the R-Score calculation may include students from several classes. ▸ Where can I find more information about the R-Score? ▸ Can I calculate my own R-Score? No, because you do not have access to the required group strength data. ▸ What is the difference between the R-Score and the Z-Score? The Z-Score predates the R-Score and is no longer used. It did not include an adjustment for the group strength. ▸ Is the R-Score the only criterion used for university admission? No. A few programs have additional criteria, such as an admission essay, CV, interview, audition, portfolio, letters of recommendation or entrance exams. Universities publish all admission criteria on their websites. Also, remember that only Quebec universities consider the R-Score. ▸ Will attending Marianopolis negatively affect my R-Score? Actually, attending Marianopolis is likely to help your R-Score. That’s because Marianopolis students benefit from a higher group strength due to the stronger academic strength of the students admitted to the College. As with any group, your R-Score also reflects your relative standing in that group (i.e., your grade relative to the grades of the other students in the course). ▸ If I do extremely well but so does everyone else, will my R-Score suffer? No. Your R-Score will reflect your relative standing in that group, so you would not suffer from being average in your course. You would still also benefit from the group strength component in a strong group (based on the group’s high school grades relative to other students in Quebec). ▸ If I’m an average student but everyone else does extremely well, will my R-Score suffer? While your R-Score would reflect your relative standing in that group (i.e., below average), you would still benefit from the group strength component in a strong group (based on their high school grades relative to other students in Quebec). ▸ How does being in an Honours program affect my R-Score? It doesn’t. Honours students write the same final exams as the non-Honours classes of their courses so as to produce fair R-Scores for all students.